Last month we created a super simple, yummy and healthy green juice! If you’d like that recipe you can check that out here: Homemade Green Pressed Juice. So this month I just knew I had to bring you something sweet and delicious! Get ready for this because this month we’ve got a cookie butter fudge recipe to die for! And yeah, it’s vegan!! Now, without further ado, let’s get into this scrumdiddlyumptious recipe that can be made time and time again. And no, there is not an ounce of healthy in this but it’s okay to indulge every now and again right! Vegan Chocolate chips: You can use any brand that your grocery store has as long as it’s vegan. I used the 365 brand that just happened to be available that day! Most not all, but most dark chocolates do not contain milk but please remember to read the label as needed! Vegan Butter: I used the brand Earth Balance but again, use what your grocery store has just make sure it’s vegan! Cookie Butter: Oh, the star ingredient!! Cookie butter can be expensive depending on where you buy it but if you have a trader joe’s near you, they are pretty well known for their cookie butter! Coconut Milk: We are going to use coconut milk to replace the evaporated milk that is used in traditional fudge recipes. I personally chose to use the Thai brand in unsweetened because I enjoy that brand the best! As always, I will write out the directions in detail as well as show you in pictures how to create this delicious recipe! IF you would like this to be done differently, please let me know below! Who’s super pumped about this?? Grab your glass bowls, spatulas and measuring cups and let’s go! 1. * OVERNIGHT* Tip your coconut milk can upside down and leave in the refrigerator overnight. This will help the milk and the coconut water sperate making it easier to remove and use the next day. 2. Add two cups of chocolate chips, 1/4 cup of butter and 1/2 cup of cookie butter to a large mixing bowl. Melt the everything together in the microwave. I did this in 30-second increments which worked really well! Make sure everything is mixed together really well and that there are no lumps. 3. Remove your coconut milk can from the fridge and flip right side up. Remove the top with a can opener and you will see the coconut milk at the top. Scoop out the coconut milk with a spoon and add to the melted chocolate and cookie butter mixture. *you will have coconut water left over at the bottom of the can, this can be reused in the healthy juice recipe I made last week! You can check that out Healthy Vegan Pressed Juice. 4. Using a hand mixer, mix the coconut milk well with the other ingredients. I used a hand mixer to make sure there were no lumps or bumps in my fudge batter. 5. One all ingredients are mixed thoroughly, pour it into any sized container you want! Make sure to line the bottom of the pan with parchment paper!! I used an 8×8 pan. Put the container in the fridge for 4 hours, cut your fudge and enjoy! I added a bit more melted cookie butter to the top just for a fancier look and well…I’m kind of in love with cookie butter! Delicious, creamy and not to mention chocolaty fudge that everyone will love! This recipe takes less than 10 minutes to put together and has simple ingredients! It may not be healthy but hey, it sure is the perfect fix when you’re craving something sweet! If you make this recipe and share it let us know! We’d love to hear how your family and friends enjoyed it! I haven’t made fudge since becoming vegan. Thanks for the inspiration! Thank you Jen. Hope that you enjoy this delicious fudge recipe! Definitely going to try it! I haven’t had fudge in so long! We love fudge and this recipe was delicious! Sign me up to be your taste-tester!! I don’t normally eat vegan but sometime I like the recipes better. yum! I had way too much fun taste testing this recipe!! OMG I LOVE cookie butter. This looks like them most incredible fudge! Love that it is vegan. Cookie butter is amazing!!! It’s really delicious, creamy and of course, cookie buttery! Once we went vegan, I knew I had to create a vegan fudge recipe that everyone could enjoy! Hope you like it! This fudge looks amazingly delicious! And it only taking 10 min to make?? Bonus! I will be grocery shopping the ingredients tonight! It’s really delicious! And yeah! Really quick to make which I love! I hope you enjoy it as much as we did! I’ve never heard of cookie butter. But if it’s as good and cookies and butter, I’m sure it’s a wonderful ingredient. Pinning this! Cookie butter is absolutely delicious!! It tastes..well, like a cookie but with the texture of peanut butter! Thank you so much for the pin, Alexandra! I could eat a pan of this…well, a couple of pieces at least. It sounds delicious. OMG this sounds absolutely incredible! I will have to try this. Thank you! We hope that you try it and love it as much as we did!! This is my kind of easy but luscious dessert! Love that it’s vegan too! Love trying out easy and delicious vegan recipes! Thank you! Such a delicious treat to make for Valentine’s Day! I can’t make fudge to save my life but my mom can! I’m sending this her way!! Thank you for sending the recipe to your mom so you both can enjoy the fudge!! I’ve been looking for a vegan fudge recipe for ages! Thanks for sharing! We have been looking for one also, but this one really helps with that “fudge craving”!! This is PERFECT. I literally made my own cookie butter yesterday with mixed nuts and dates in my vitamix. I’m writing about it soon on my blog because it is crazy addicting. 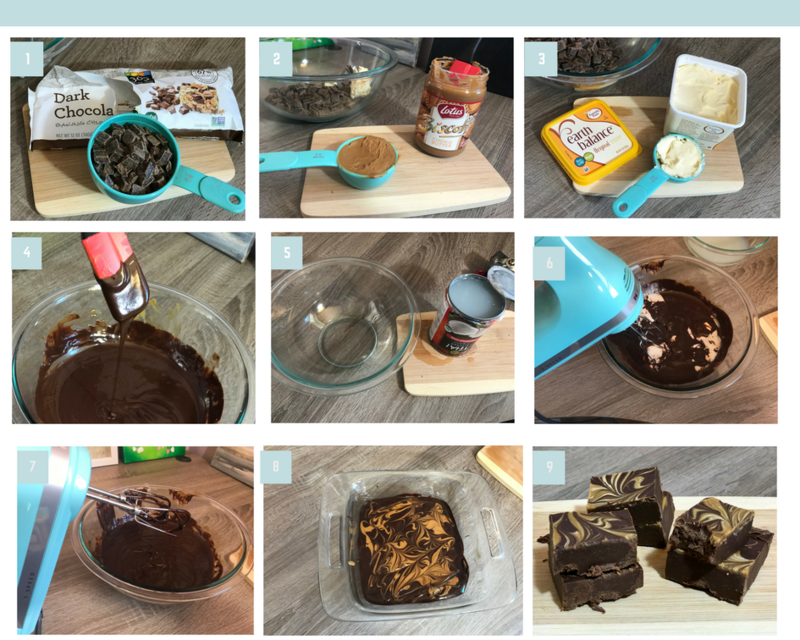 This fudge looks amazing, and I’m pretty sure I’m going to have to make it now! I didn’t think about it that you can use coconut milk to make fudge. Amazing! Oh wow, homemade cookie butter sounds incredible!! I hope you enjoy this recipe as much as we did! Great recipe! This would be fun to make with kids too. Yeah absolutely! And with minimal ingredients, it’s super easy to make! This looks so delicious! You can’t beat the combination of chocolate and peanut butter!!! Yes! Love chocolate and peanut butter together! This sounds FABULOUS!! And easy! Can’t wait to try it! It’s so good! I hope you enjoy this recipe!! This sounds SO good! I LOOOVE the TJ cookie butter. Seriously amazing and oh so tasty. I can only imagine how yummy this fudge is! Me too!!! Tj’s is the best! Enjoy the fudge! You had me at cookie butter. YUM! Seriously, cookie butter is the BEST!!! Enjoy making this recipe, Amanda!